I like to try different services and functionality that available, so this is my experience and guide on how to set up your Nets Flashcard card to automatically top up credit. That way you don't have to worry about it too much. Please note that these steps only apply to users of "Nets Flashpay" card. This is service offered by Nets is also known as the "Auto Top-Up (ATU) by Credit/Debit Card" or "Auto Reload Nets Flashpay". It works in a similar way as the EZ-Reload (you can read my guide for that one here). With Auto Top-Up, your FlashPay card will be automatically topped up with a preset amount ($30, $40 or $50) when there is insufficient stored value on the card to make payment for transit, ERP and car park charges. Note - While I find the Nets Flashpay card as a great card to use and pay cashless - for products and services such as cabs/ taxis, food, shopping and other goodies. It is convenient, but only when there is sufficient funds available on the card. That is, while the auto top up is great (like the Ez-link auto top up), it will only auto reload on public transport/ transit, ERP and car park machines. Just like the Ez link card, I have tested it a few times and it will not auto reload anywhere else (at this time of writing). 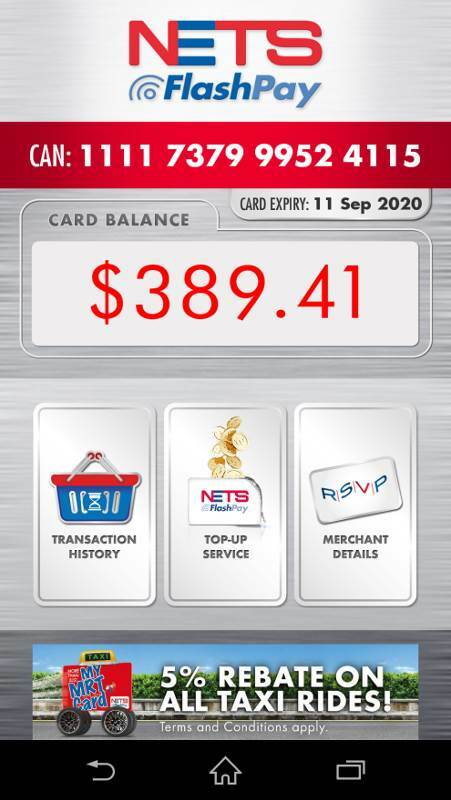 Have the Nets Flashpay card with you - Please just flip the card that you and have a look at the very bottom. It should have a CAN number and an Nets Flashpay symbol somewhere. You'll need this CAN number for later. Check that you have your NRIC/ FIN and personal details ready - NRIC is a National Registration Identity Card and for foreigners can be an Employment Pass (EP), etc. A valid email address/ mobile number - This is as the application status and collection slip number will be sent to you via email/ sms. 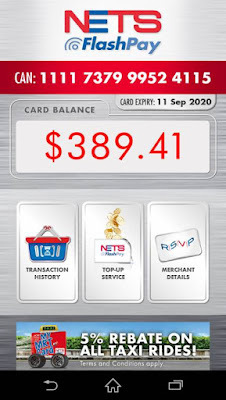 Know how much Nets Auto Top Up-Reload amount you want - At the moment you have to go through whole process again (cancel and reapply) if you want to change this amount, so just think about whether you want to reload $30, $40, or $50 for each auto reload. I'd say to help keep track more easily and to factor in the small admin fee that costs $0.25 for each auto reload, the more the better, but this depends on your personal habits. If you often lose things, it may be worth not loading up too much at once or even using this auto reload option at all. Wait for activation code to be sent to you via email/ sms - A 6-digit activation code will be typically sent to you via SMS or email 2 days upon successful registration. I received my activation code via sms. Register your card with activation code - There are two ways to do this. Options are detailed below. Visit a Transit office. Transit Link offices in Singapore locations are detailed on this website. Pass your Nets Flashpay card and activation code to them - Show them your activation code and your Nets Flashpay and they will activate it on their system. It should only take a few minutes for it to be activated. Enjoy the auto top functionality on your card! Note - The process above refers to activating this by visiting the Transit Link Ticket office, you can also try the app process (option 2 below) as well. Android Phone (with NFC) users can activate the FlashPay ATU service instantly on their phones after receiving their activation code without having to make a trip to the TransitLink Ticket office. Cardholders will receive the activation code two days after they have registered their card details on the app and the code is valid for 7 days for instant activation. EZLink card, NETS FlashPay cards what are the differences? 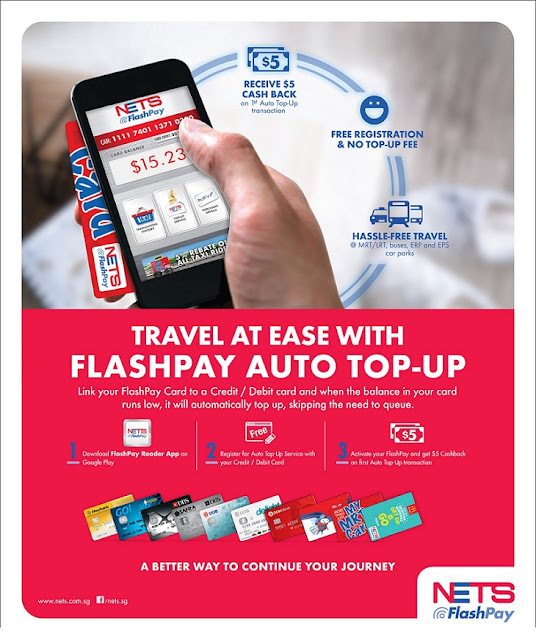 Nets Flashpay article on their new app auto load functionality, "NETS Launches Instant Auto Top Up Activation On Android Phone"